Remember that when you graduate and enter the job market, nobody really knows who you are. Not only must you introduce yourself to the marketplace, you must be remembered to stand out. 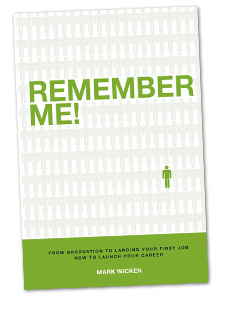 After countless interviews, the person who gets the job is the person who the company remembers. There are many points in the process when you will have a chance to stand out from your competition. Your resumé is most often the first point of contact with a potential employer. How will they choose you versus the others? If there was a perfect resumé or a perfect template for a resumé everyone would have a perfect resumé but obviously there isn’t. The main reason for this is that everyone is different. So then, why would you use the same words as everyone else on your resumé if you wanted to stand out and be remembered. Clichés like ‘detailed-oriented’ or ‘good communication skills’ in absence of context are meaningless and in no way make your resumé and you different from all the other candidates and resumés an employer will see. Remember, the real purpose of the resumé is to get an interview so you must give the employer a good reason to want to meet you. You do this by citing examples of your ‘attention to detail,’ or your ‘communication skills’ in context with previous jobs, part-time, summer or intern employment. An excellent way to do this is to list the ‘Skills Learned’ after every job experience on your resumé. What you learn from your past experience is what you bring to the job. Convince the employer you have these skills by giving examples. You will stand out and increase your chances of getting the interview because most graduates won’t write their resumé in this way.